Chester County, Pennsylvania (1881) -- On Saturday, June 29th, 1737, Chester County Justice of the Peace Elisha Gatchell1 was beaten, kidnapped and jailed by members in the Maryland garrison. According to the "History of Chester County, Pennsylvania", written by J. Smith Futhey and Gilbert Cope and published in 1881, Gatchell was beaten and arrested by men under the command of Maryland Captain John Charlton as the result of an ongoing border dispute at the time between Maryland and Pennsylvania. This was the second such incident that occurred to Gatchell because of his duties as Justice of the Peace and the uncertain boundary between Maryland and Pennsylvania. The earlier event took place nearly 15 years earlier. In both cases, Elisha Gatchell ended up being detained in Maryland jails. 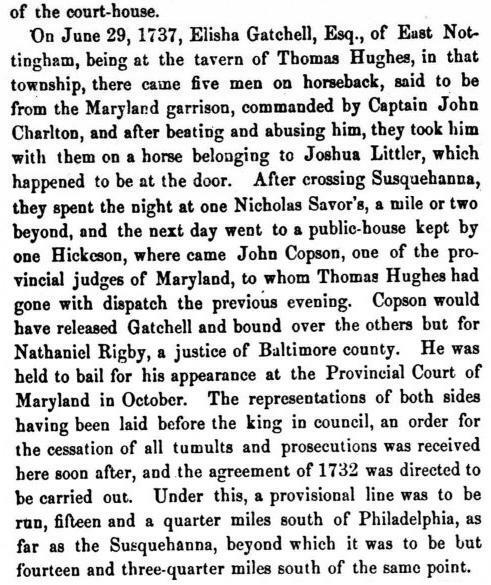 "On June 29, 1737, Elisha Gatchell, Esq., of East Nottingham, being at the tavern of Thomas Hughes, in that township, there came five men on horseback, said to be from the Maryland garrison, commanded by Captain John Charlton, and after beating and abusing him, they took him with them on a horse belonging to Joshua Littler, which happened to be at the door. After crossing Susquehanna, they spent the night at one Nicholas Savor's, a mile or two beyond, and the next day went to a public-house kept by one Hickeson, where came John Copson, one of the provincial judges of Maryland, to whom Thomas Hughes had gone with dispatch the previous evening. Copson would have released Gatchell and bound over the others but for Nathaniel Rigby, a justice from Baltimore county. He was held to bail for his appearance at the Provincial Court of Maryland in October. The representations of both sides having been laid before the king in council, an order for the cessation of all tumults and prosecutions was received here soon after, and the agreement of 1732 was directed to be carried out. Under this, a provisional line was to be run, fifteen and a quarter miles south of Philadelphia, as far as the Susquehanna, beyond which it was to be but fourteen and three-quarter miles south of the same point." Records of the earlier event can be found in the minute books of the Early Pennsylvania Land Records. At a meeting of commissioners held November 20, 1722, it is thus noted that both Isaac Taylor, surveyor of Chester County and Elisha Gatchel, a Justice of the Peace of the same county, were seized and jailed under the "pretence of their having invaded the Lands of or belonging to Maryland." Taylor and Gatchel appealed to the commissioners in Philadelphia, pleading that they were unjustly arrested "for no other Cause than their acting in their Stations in the Service of the Prop'r of the Province" of Pennsylvania. As a result of their situation, the commissioners agreed to help defray the expenses incurred by Elisha Gatchel and Isaac Taylor for their own defense. The minutes further state "it was then the Opinion of the Commissioners that some Money should be advanced to them out of the Prop'rs Estate to support and encourage them in defending their cause, whereupon �7s 10d was then paid to them, besides a Pistol given Thomas Reid towards paying for an Express to Philad'a on a like Occasion, four Pounds two Shillings paid Elisha Gatchell, expended by him for an Express to Annopolis and Philad'a." Finally, the minute book states that a further sum of � should be advanced to Isaac Taylor and Elisha Gatchell toward "supporting their Charges under their Confinem't in Cecil county". The commissioners then agreed further help would be considered in the event additional action was taken by the government of Maryland in this case. 1Elisha Gatchell was the son of Jeremiah Gatchell, who was the first cousin of Stanley Getchell's 6th great-grandfather Samuel Gatchell, Jr. of Salisbury, Massachusetts. This makes Elisha a 2nd cousin to Joseph Getchell, Sr., Stanley Getchell's 5th great-grandfather. Elisha's grandfather John Gatchell was the brother of Stanley's 7th great-grandfather Samuel Gatchell, Sr.. Both John and Samuel, Sr., came together from England to America and settled in Massachusetts, John in Marblehead, Massachusetts, and Samuel in Salisbury, Massachusetts.